This pattern first appeared on my old blog in November 2014, as part of the Crochet meets Patchwork blanket. The Crochet meets Patchwork Blanket is an ongoing project that is inspired by scrappy, patchwork quilts. It provides a great opportunity to play with colours, try different motifs and learn new crochet stitches. All the patterns for the squares used in this blanket are free - some are mine, some are by other designers (always credited; if you spot one I've credited to the wrong person please get in touch). You can find details of the project, including step-by-step tutorials to my own patterns, on the Project Page. A complete ebook guide will be available in due course. You can also find all the patterns and tutorials mentioned below on the Crochet meets Patchwork Pinterest Board, and follow along with my progress on the Emmy + LIEN instagram account. This pretty, puffy square is my first design for the Crochet meets Patchwork blanket. It uses 3 rounds of puff stitches at the centre to achieve a distinctive look and texture. If you're new to puff stitches, there's a free tutorial for you here. Each round of this square is of course fully illustrated below. If you would like to download and print this pattern, you can purchase a beautifully laid-out PDF copy from my Ravelry store. The pattern costs just €1.50 excl. VAT (about $1.50 USD depending on the exchange rate), and you will be able to choose between US terms or UK terms. By paying this small fee, you help me keep Emmy + LIEN afloat! For this tutorial I've used DMC Natura Just Cotton, which is a 4-ply yarn. I personally love cotton because it's neat and washes well, but you could use any yarn you like. If you use a heavier yarn, remember you'll need a bigger hook and that your final square will be larger too. With colour A and using the larger hook, make a starting chain of 6, then make a circle by working a sl.st into the first ch. Ch 1, then work 8 puff st into the circle, remembering to lock each one with a ch 1. Join by making a sl.st. into the ch 1 at the beginning of the round. Cut yarn and fasten off by pulling through to the back the work. Attach colour B, ch 1 and puff st 2 in every ch 1 space (16 puff sts in total). Join by making a sl.st. into the ch 1 at the beginning of the round. Cut yarn and Fasten off. Attach colour C into any ch 1 space between a pair of puff stitches and ch 1. *Puff st 2 in between a pair of puff sts, puff st 1 in the space between pairs. Repeat from * to end. Join by making a sl.st. into the ch 1 at the beginning of the round. Cut yarn and Fasten off. On this round, we will only work in the ch 1 spaces in between a pair of puff sts, and skip over the single puff sts. With colour B, STC (SDC) 1 in any ch 1 space in between a pair of puff st. TC (DC) 1, ch 1. *DC (SC) 3 in the ch 1 space between the next pair of puff sts. Ch 1. TC (DC) 3 in the ch 1 space between the next pair of puff sts, ch 3, TC (DC) 3 in the same space. Repeat from * until you've gone all the way round. Join by making a sl.st. into the STC (SDC) 1 at the beginning of the round. Cut yarn and Fasten off. From this point onwards, we make the square grow by using traditional granny treble rounds. With colour D, STC (SDC) 1 in the ch 1 space between any TC (DC) 3 and DC (SC) 3. TC (DC) 2, ch 1, skip 3 sts and TC (DC) 3 in the next ch 1 space, ch 1. 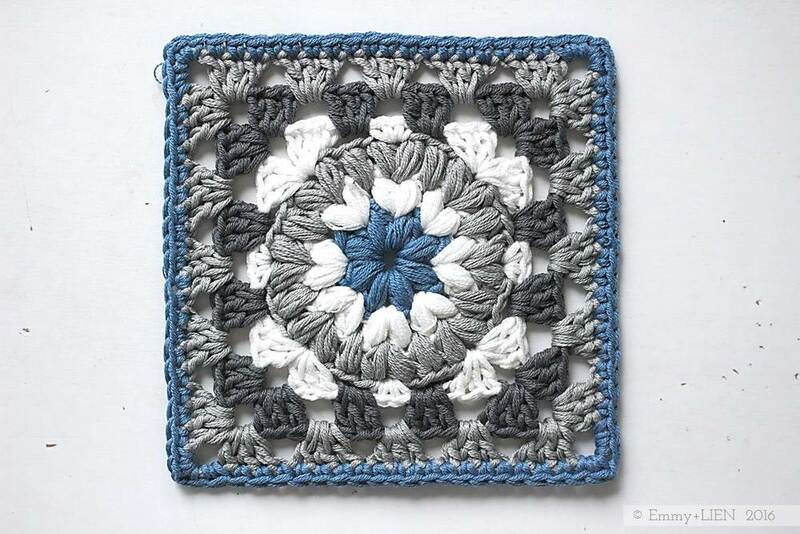 Continue going around the square as you would with a traditional, basic granny square. On the corners, TC (DC) 3, ch 3, TC (DC) 3 around the ch 3 space. Join by making a sl.st. into the STC (SDC) 1 at the beginning of the round. Cut yarn and Fasten off. Repeat Round 6 with colour C.
Switch to the smaller hook. Attach colour A in any st of round 6, then DC (SC) 1 in each st. On the corners, DC (SC) 2, ch 1, DC (SC) 2 around the ch 3 space. At the end of the round, join to the first DC (SC) with a sl.st. Cut yarn and Fasten off. That's it! Now it's time to sew in and trim any ends on the reverse side and block the square by laying it out on a foam block or mat, spraying with water until soaked, and pinning it into shape. Leave it to dry completely (away from direct sunlight). Enjoy all this puffy goodness, and don't forget to share your work via the Emmy + LIEN facebook page, or on instagram using the #triplepuffgranny hashtag. Happy Hooking! You may not reproduce the photos, pattern or tutorial, either partially or in full, contained in this post without obtaining written permission from me first. If you would like to produce your own photo tutorial, video tutorial or translation of this pattern, please get in touch with me to obtain permission first.